Analysis: Who is the NBA's Fastest Player in 2013? 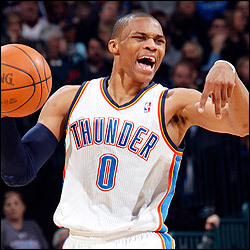 Analysis: Who is the NBA’s Fastest Player in 2013? When it comes to the fastest players in the NBA, a lot of people are quick to throw their favorite names into the mix. There are many lists that are determined in with “yeah this feels right” approach, but if you are looking for a list that is (mostly) grounded in some sort of statistical or factual reality, then this is the list for you, my friend. The results were surprising. It may surprise many people to see Devin Harris’s name on this list, but it is for a good reason: according to the Guinness Book of World Records, Harris is the fastest man in the world with a ball in his hands. During the 2009 Eastern Conference All-Star’s Practice in 2009, he dribbled from baseline to baseline in 3.9 seconds, which is the best that has ever been recorded by anyone, ever. Long-time Coach George Karl has stated that Lawson may be the fastest player that he has ever coached. On the Nuggets, “No one is as fast as Ty – Ty with the ball is like Tony Parker,” he explained in an 2012 interview. “The quickness of his starts is what’s powerful.” Check him out in action below. With the introduction of the new NBA STATS cameras, the league is getting an even more comprehensive view of the statistics in NBA basketball, and speed is of course a topic of interest for both the league and fans. Ricky Rubio was second to only Tony Parker (below) in a race across the court in-game with the ball. The STATS cameras recorded his speed at an impressive 19.4 miles an hour. According to the numbers, Tony Parker is absolutely unbeatable in an open-court breakaway. Statisticians have clocked him moving at over 20.9 miles per hour in the open court. That type of speed is illegal in school zones, and definitely blows away the rest of the players recorded by a fairly impressive margin. The rest of the speeders analyzed by the STATS system—Russell Westbrook, Rajon Rondo, Kyle Lowry, Brandon Jennings, and Jose Calderon— were around the 17.0 miles an hour range. While Parker may have lost Eva Longoria, he definitely hasn’t lost any of his speed. If anything, she might have been slowing the 30-year-old down. The fastest player in the NBA turns 31 next month. For the past couple of years many people would have given both titles to Derrick Rose, pretty much unquestionably due to a type of quickness and speed that bordered on the supernatural. Rose would score the fastest 3/4 court sprint (3.08) of the players mentioned here except for Robinson, making him, unquestionably, the fastest member of the Chicago Bulls to ever wear the uniform. However, a devastating knee injury has seen him debilitated for the past two seasons. His speed is not what it once was, but he is still moving faster than you ever will in your life. Conley comes into this list with a sprint speed of 3.09, just edging out Ty Lawson (3.12). If you were watching Game 3 of the LA Clippers vs. the Memphis Grizzlies in the 2013 NBA playoffs you would have seen Conley’s speed on display in a dazzling defensive effort over Chris Paul (3.22), whose agility is normally more than a problem for most point guards to handle. Conley complements the Grizzlies’ grind-you-down style, and as such you won’t see him flying back and forth across the court as much with the ball. He is more of the marching quarterback type player, but when he needs to he can flip the nitrous switch and pull away from you like Vin Diesel in a muscle car. Nate’s claim to fame comes from mostly his jumping ability, which earned him three slam dunk titles, the first and only player to accomplish that feat—and yet Robinson’s speed is probably what allows him to be the better player overall. The official NBA records recorded his pre-draft baseline sprint at one of the fastest ever, an impressive 2.96, faster than Derrick Rose (3.05). However, at age 29, he has probably dropped down just below the 3.08 range—you know, the Russell Westbrook, ‘one of the fastest people to play the game,’ range. Whether he is on the ground, or flying through the air, Russell Westbrook does just about everything with one speed: faster than is comfortable to watch. He is the type of guy that explodes around the basketball court at breakneck speeds while onlookers grimace in real fear for his safety and wellbeing. And yet, you shouldn’t: he has the longest active streak of consecutive games played in the NBA. Westbrook’s seemingly unbreakable body that is the apex of basketball’s evolution thus far—the Übermensch who exists beyond the physical bounds of ordinary people. His sprint time of 3.08 was second to only the ex-King of Speed, Derrick Rose. Official NBA 3/4 court sprint times: Nate Robinson (2.96), Derrick Rose (3.05), Russell Westbrook (3.08), Mike Conley (3.09), and Ty Lawson (3.12). NBA STATS with-the-ball times: Tony Parker (20.9 mph), Ricky Rubio (19.4 mph), Russell Westbrook, Rajon Rondo, Kyle Lowry, Brandon Jennings, Jose Calderon (~17.0 mph).